What's It To YOU? : ALL ABOARD!!! As many of you know, Steve and I are huge rail fans. Yesterday was the 140th anniversary of the driving of the Golden Spike. But with it being Mother's Day, I figured I had better take the safe way out and blog about Mother's instead of this tiny bit of history. So, today, I will do a blog about Railroads and their role in our lives. We love living so close to the tracks (2 houses separate us)! Last Saturday was National Train Day, yes it is for real, no kidding, I promise! Those of us in Utah and many more across the nation and even a few around the world know very well that yesterday was the anniversary of the driving of the Golden Spike. On 10 May 1869, the Transcontinental Railroad came together at Promontory Summit in the famous Golden Spike ceremony. Now, I have to be completely honest and say that neither one of us has ever actually been out to this national historical site. We will make that trip one day. Steve says he has no idea where his love of all things trains comes from. Me, well, my dad worked for Kennecott Copper (I would love to tag along with anyone going up to the visitors center) for 30 years and ended his career as an engineer and, well, I was (am) a daddy's girl! In fact, when I was little, I used to think or say that my dad sat on the stairs to eat his lunch, LOL...stairs! We like to go watch trains, yes, watch trains. This is where we go park somewhere and basically wait around for trains to come by. Especially nice now that Steve has a fancy camera to take some really really good pictures, see below! Sounds boring, right? Well, I used to think the idea was boring, too. I am a multi-tasker and so the thought of just sitting around waiting did not thrill me. In this way, Steve is way more of a rail fan than I ever thought I would be! My solution to this possibly boring situation is reading, writing and now listening to my i-pod. These are great things to be able to do and gives me something, no matter if it is day or night when we decide to just go watch trains! One of the best places to do this is in Salt Lake is called Grants Tower, I jokingly call it Grants Tomb. The reason we like this spot is because pretty much any train that travels through Salt Lake goes through this area. Not far from here is the office for the Salt Lake, Garfield & Western Railway, a small company that I almost had a job with once...Michael, if you are out here, I'm still interested in that position, you know how to get ahold of me! There are several places we like to go watch trains, Steve usually knows where to go whatever time of day it is and we always have a good time just spending time together! We have taken Amtrak twice. Both only between here and Denver. The first time was when Steve turned his truck in to Werner and there were supposed threats that Amtrak was going to die, so we thought we had better take the opportunity while we could, so we rode Amtrak home. Then, of course, Amtrak didn't die. The following summer part of the track was closed in CO, so we took a round trip to Denver and were able to ride Amtrak through WY. We enjoyed both trips and have hopes to one day take a trip on Amtrak completely around the country. There are several places around the country that have some really nice setups for rail fains, for example, the Golden Spike Tower in NE. We love to incorporate our love of trains into our trips whenever we can, too. There are many railroad excursions all over the place for those interested! We have also been on the Durango/Silverton train, which is an absolutely beautiful ride! We have been on the comedy murder mystery ride at the Heber Valley Railroad, very fun! Of course, we can't forget our very own Union Station in Ogden! The internet is a place where most anyone can find most anything about everything. Trains are no different. There are even subscription sites like Train Orders where rail fans share stories, pics, videos and such with each other. Steve does subscribe to this site and has made a few friends locally and elsewhere that we look forward to meeting in person someday! I especially like the info on trains move our economy found on the national train day website. Another day trip we are interested in taking is the Cumbres/Toltec in NM. Taken along 500 W in Salt Lake at exactly 4:08pm, which is the time my dad died exactly 13 years before this was taken, the engineer even blew the horn for us at that exact moment, too! It was quite an interesting moment in time for us that day, which was our 12th wedding anniversary! Taken outside our house. See, we have a great view of the tracks and we love it! 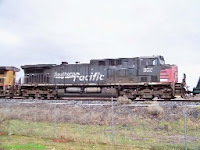 I have no idea what date this was taken, but it is Southern Pacific engine 352, now owned by Union Pacific. 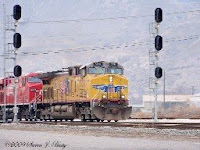 This was taken on 2 May 2009 in part of the Provo rail yard. 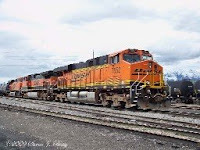 It is Burlington Northern Santa Fe (BNSF) 7552 during a crew change. This was taken in Llynndyl on 5 Apr 2009. I think this is very close to being our absolute favorite pic, so far. I am certain there are many more to come! My mom once told one of my great nieces that every time she hears a train whistle, it is Grandpa saying he loves her. I think several of us have taken this to heart and find the sounds of trains, not just the whistles, comforting. Hey, don't knock it, if an angel can get its wings every time a bell rings, anything is possible! Enjoy exploring all the links and leave your own rail interest and/or stories in the comments! I actually already knew about National Train Day, but I totally forgot about it on Saturday. My Bad!... We should've done something to celebrate it. Promontory Summit is a fun trip. It only takes about a fourty minutes to get there from Brigham City, I think. You should totally go one day. IN the summer they do reenactments, and that is pretty cool. Ephraim very much appreciated your pictures. I would like to know where Grant's NEst is though..or tower.. .whatever it was. I think we have to go there some time while we are in Utah. I am enjoying your blogs! Every woman is a mother, to one degree or another. Don't you ever feel like your Husband's mother? I do, sometimes. The Southern Pacific engine pic was taken on 4/9/2009. Alysia, Grant Tower is located near the UTA Garage downtown at about 600 W South Temple. 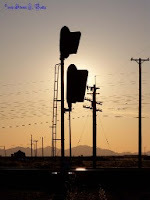 We always park under I15 where we can see most of the railroad signals. Unfortunately, the area is a Quiet Zone, so there are no Train Horns to let you know a train is coming. Alysia, I always forget about National Train Day, too, until the day or two afterwards. One of these years, eh?! Ya, Steve gave the address, but you can't get there directly on South Temple, you have to use 600 W from North Temple or 200 S.
LOL, yes, I have felt like my husband's mother...too funny that you offer that perspective! Steve, thank you, I had no idea when you had snapped that shot! Also, thank you for the info on Grant's Tomb...er, Tower! I don't like that they have made it a quiet zone, the whistle is a very important sound to some of us! We have visited the Golden Spike place before. It was pretty cool and they had a lot to do there. They do some sort of reenactment on the anniversaries. I think it is worth the drive and that you would like it a lot. I think it is cool how much you guys love trains!